Today we take a tour to Germany, where the ever popular Hollywood Hills is a home away from home to many well-known stars, actors and celebrities. This magnificent home matches the neighbourhood perfectly and is also known as Villa Hollywood, with all the modern elements available at hand, making this fabulous home a pleasure to visit and enjoy. The exceptional 720sqm plot has taken comfortable living to the next level, with the addition of features such as a luxurious spa, which allows for rejuvenation and tranquillity in this home nestled into the hillside. 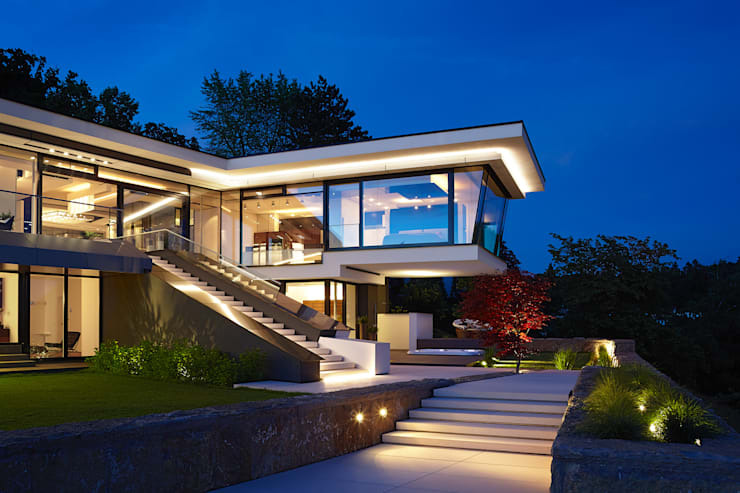 With unparalleled views and modern fittings and fixtures, this contemporary home is more than just a residence, it is a lifestyle choice. 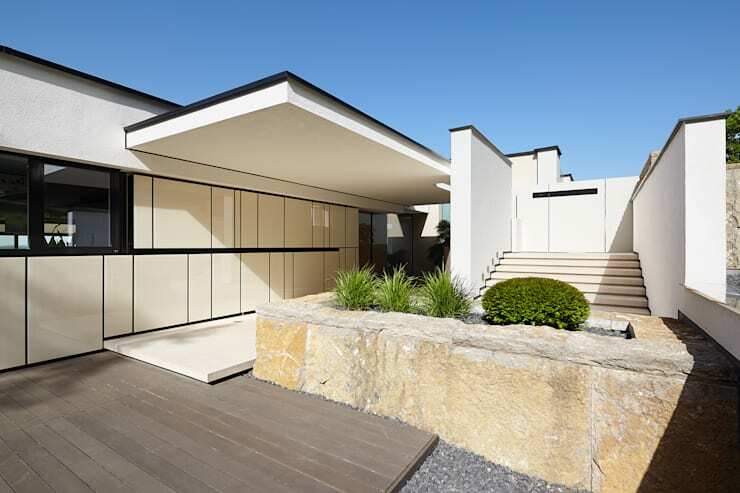 You can view more beautiful homes from Lee+Mir Architects, here. A view from the south side of this amazing villa shows off the upper and lower levels of the home, allowing us to take in the immense space available, which is further exaggerated by the large floor to ceiling glass windows and sliding doors, allowing for natural sunlight to bathe this home during the day. The home provides an imposing view of the stunning valley allowing for some green elements to become a part of the home, environment and eco-friendliness plays an integral role in any true modern home anyway. The building opens up on both the upper and lower levels, the main living apartment is situated on the upper level, while the granny flat and spa are located on the garden level of this model home. A home such as this is fit for any celebrity or A-lister, but that doesn’t mean that you can’t have a piece of it too! Take a look inside this picturesque residential beauty and get some idea of the breath taking panoramic views available from the open plan living space. The main house certainly has views par excellence. But that doesn’t mean that the indoor design is not amazing too! The living room and dining room areas are separated by a custom made gas fireplace, providing warmth to both sides of the open plan space. In keeping with the similar floating look and feel, uniform suspended walls were included in other parts of the room as a décor element. The neutral tones coupled with the large glass windows allows the view to be the focal point, even though the modern design is something quite special too. With adequate storage space and the inclusion of an ultra-modern swivelling flat screen TV set hidden beneath the floor, which appears at the touch of a button, this stylish and modern room fits the outside design perfectly! To appreciate this terrace, you have to admire the elements that allow it to be more than just a terrace. This terrace can very easily transform into an extension of the kitchen and even dining room, allowing for a perfect outdoor entertainment area for those outgoing social occasions. The colours utilised in the design are all neutral, making this part of the home timeless and stylish, while being a high quality home too. It’s the added extras that make a home comfortable and that much more liveable. 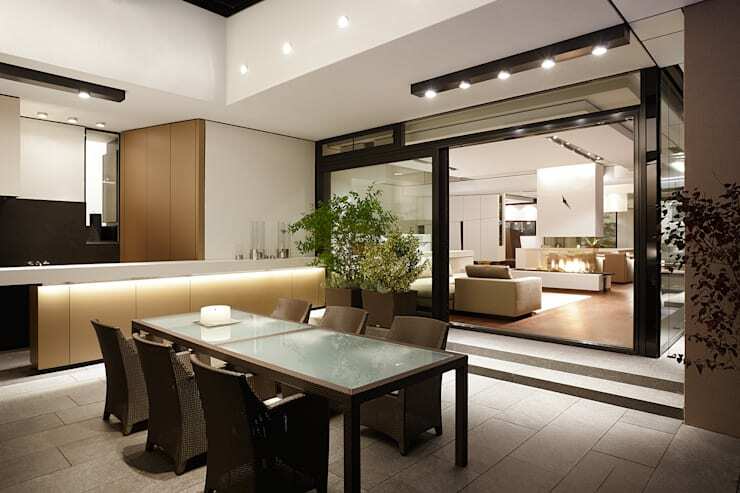 The modern and sleek design and décor pieces along with the elegant lighting will create a pleasurable outdoor entertainment experience, regardless of the time of day. And due to the fact that the terrace is partially covered, the space can be used regardless of season too! Located on the garden level of this stunning Villa Hollywood, the spacious garden of the home has been made even more relaxing and exciting through the addition of a luxurious spa, sauna and sundeck as well as covered hot tub and outdoor shower. This fascinating experienced can be accessed from upstairs through an outdoor staircase as well, while the cover of the hot tub is motorised for a sleeker more modern, minimalist effect, as has been celebrated throughout this stunning designer home. Soak up the sun, while lounging on one of the many well-placed sunbeds or just enjoy the view of the sun on the horizon at any time of the day. Take in the immense greenery and just enjoy the view, the sights and everything this modern home has to offer. If you need more design inspiration to create a home spa within your own private space, then check out: Relax! Home Spas Made Easy. The modern facade with the elegant high walls create a compound-like effect in the creation of this home, but these high walls are also integral in keeping the life of the inhabitants completely private and safe from prying eyes and the outside world. The contemporary style is perfect with the all-white walls and simple use of neutral tones that complete the design and decor elements, while the large windows and glazing provide an open and airy effect, allowing for ventilation to be experienced indoors throughout the day. The creation and design of this masterpiece home provides adequate sunlight and ventilation to both the upper and lower levels, while the stonework adds a rustic element. While the additional greenery on this space bring that eco-friendly element through to this outdoor area as well. Living in this extravagant home, is more like living in the lap of luxury, the home and sights are to be taken in and enjoyed. From this angle, the entire spacious and opulent home can be admired and enjoyed from top to bottom with all the sights and modern aspects in full view of the visitors to the property. The luxury is noticeable from the upper level to the lower level, with similar clean lines and modern elements used to create both the inside and outside of the magnificent villa. We also catch a glimpse of the outdoor spa area here and the simple use of colour and transparency allows the home itself to look grand without any added frills. The simplicity and elegance of this eclectic residence is evidence that the owners or inhabitants appreciate the finer things in life, but without being too flashy or ostentatious, in fact this home is more an example of how to design and think of the perfect modern home. Did you like the luxury of Villa Hollywood? Or do you prefer things a little more modest? Let us know!